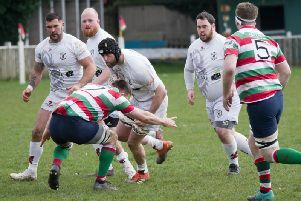 Oakfield suffered only their second defeat of the year to dent their promotion hopes as the second half of the season started. Earlier in the fixtures they dismissed Pickwick for just 63 on their way to a nine-wicket victory, but things were different in the reverse fixture on Saturday. Having won the toss, Oakfield bowled first and it looked a good decision when Chris Smith picked up a wicket in his first over. Things became tougher from here though, despite Dave Odwell picking up a wicket, as the ball stopped swinging and Pickwicks opener and number 4 counter-attacked. Aside from Smith, Oakfield didn’t bowl particularly well, although Ollie Vaughan made a promising return after injury and exerted some control. The hosts added 174 for the third wicket to take the score beyond 200. To their credit, Oakfield stuck to their task and fought back late on, Smith returning to pick up three more wickets to give an impressive return of 4-32. Luke Armstrong picked up 2 wickets and Tomas Marshall 1 as Pickwick’s innings ended up on 271-8 from 50 overs. Oakfield knew a solid start was needed should they have a chance of chasing down the large total, but lost a wicket in the first over without troubling the scorers. A further wicket went down which all but ended hopes of victory, although skipper Richard Burnett counter-attacked well. He however holed out for 24 and Oakfield were in trouble against an attack getting more movement out of the wicket. At the half way point Oakfield were 59-5. Unbelievably, five of Oakfield top six were dismissed caught behind as they looked set for a heavy defeat when they reached just 78-8 after 33 overs. Dave Odwell and Tomas Marshall then dug in showing excellent discipline in the hope of salvaging a draw. The pair batted through to the 49th over before Odwell was bowled for 19. The game was now down to the wire and with just two balls left, Chris Smith gloved a popping delivery to silly mid off as Oakfield fell agonisingly short of a draw. This was a very disappointing result for Oakfield in an otherwise successful season. It’s the first time the team has been bowled out in 2016, and they will hope to bounce back next week when they entertain Bablake. Oakfield’s 2nd XI entertained Nether Whitacre on Saturday. The visitors won the toss and elected to bat but struggled against accurate bowling from Scott Cluely (5-1-14-1) and Matt Shipman (10-2-12-1). The pair were well supported by spinners Gurj Rupal with 2-34 and Guy Smith (1-37), before Will O’Rourke ran through the tail, picking up 4-18 as the visitors were dismissed for 137. Despite a solid start through Dan Clowes (14) and Kev Vince (22), Oakfield made hard work of the small run chase. A number of batsmen got starts but didn’t go on and it took 9 not out from number 11 Matt Shipman to see Oakfield to a much needed victory. Oakfield’s 3rd team took on Newdigate at Hart Field on Saturday. Having won the toss the visitors elected to field, but were regretting this after an excellent opening partnership between Frazer Grant (88) and the returning Glyn Vaughan (62). It meant the middle order could bat with freedom and cameos from Sherwin Fernando (24), Dan Pfadenheuer (17), Brian Harris (17 not out) and Liam Green (18 not out) saw Oakfield amass 268-4 from 45 overs. The visitors made a good fist of their response, settling for a draw at 208-7. Liam Green bowled well for his 2-41, an Frazer Grant completed a good day with 3-24, while there was a wicket each for Amit Patel and Nathan Grant in Oakfield’s winning draw.